Beautifully remodeled 4 bedroom + 3 bath home with vaulted ceilings, travertine bathrooms, high-end fixtures, solid hardwood floors, large eat-in kitchen with 3 ovens, large master has walk-in closet with built-ins, beautiful master bath with walnut cabinetry, tumbled marble and jacuzzi tub. French doors throughout, moldings, large yard, newer doors and windows. 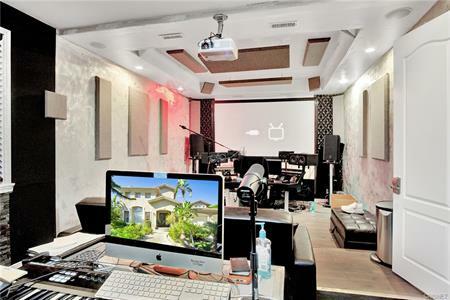 Garage has professional sound proofed music recording studio with heat and air conditioning, which can be used as an office, gym. Weekly gardener included. Move-in ready. Light and bright 3 bedroom - 1 1/2 bath, redone traditional home with refinished pool in a beautiful neighborhood of Reseda. Central air, central heat, Thermopane windows, hardwood floors, ceramic tile floor. Upgraded kitchen with beautiful maple cabinets, ceramic tile counters and backsplash, and built-in desk. Dining room, laundry area near kitchen. Recessed lighting. New paint inside and out. Covered patio. Tropical oasis backyard. Three car driveway. 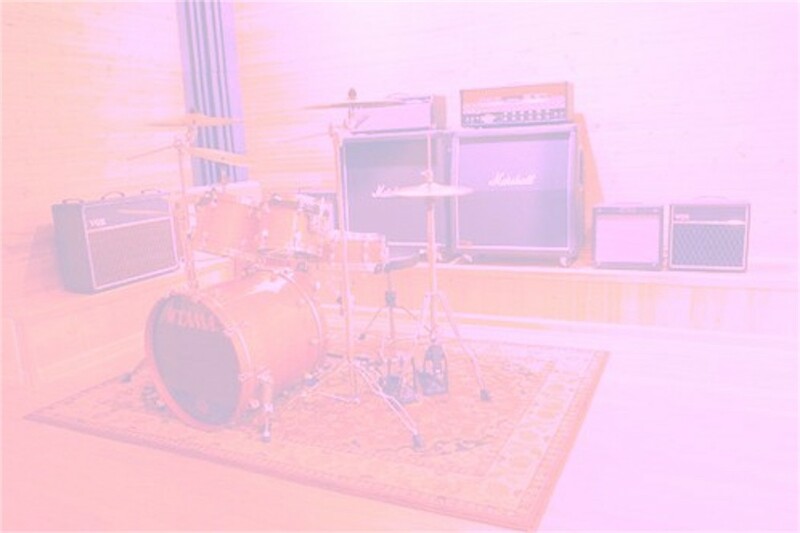 Detached garage is currently set up as an air-conditioned, soundproofed recording/music studio – could be an office, gym, man cave, art studio, granny flat? Bright and quaint North Hollywood home with an immaculate yard in a quiet neighborhood. 2 ample bedrooms and 1 centrally located bathroom, open concept living and dining room. The home has been recently remodeled with hardwood-like flooring and modern fixtures throughout. The living room boasts a wood-like wall and the kitchen has pure white shaker cabinets, black counter-tops and white subway tile. 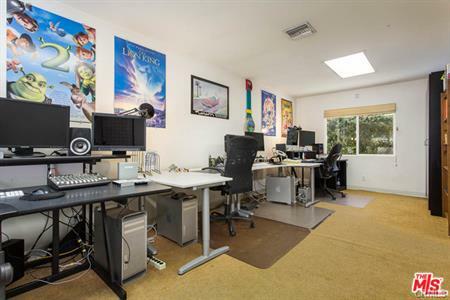 The expansive 7,100+ sqft lot has a large tree shading the backyard, a large shed, and a back unit office/recording room. This private home is great for entertaining, relaxing, and working. Spectacular super-sharp, one-of-a-kind showplace home with fantastic views and professional music studio with wet bar and bedroom. Direct entry to studio from exterior of property. Updated and upgraded throughout. Excellent floor plan. Gorgeous granite center island cook’s kitchen with amazing storage. Dining area with French doors leading to the view balcony. Lovely living room with beautiful stacked stone fireplace, walls of glass and French doors leading to the private backyard with grassy area. Fabulous family room with French doors leading to huge Saltillo tiled patio. Terrific room sizes. Outstanding south of the Blvd location. This 2,877 square foot single family home has 4 bedrooms and 4 bathrooms. It's Southwest style, recording booth, newly remodeled heated salt water pool and spa, fireplace, custom kitchen, high vaulted ceilings and large eco friendly lot with palm and pine trees. Ultra-private and gated retreat. Set way back from the street behind a large gated horseshoe driveway sits this elegant and spacious brick colonial. Luxurious grand foyer, formal dining room, parlor, living room, kitchen, and wine cellar. The recently remodeled kitchen is a cook’s dream. On the second level, you will find all four well-proportioned bedrooms, two featuring en-suite bathrooms. Private and enchanting pool area complete with grotto, water slide, and game pavilion. 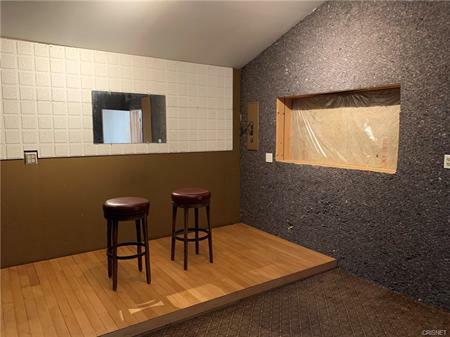 The large detached garage has been converted to a recording studio/music room with a bar. Beautifully situated near great restaurants, coffee shops, Whole Foods and Trader Joe's. 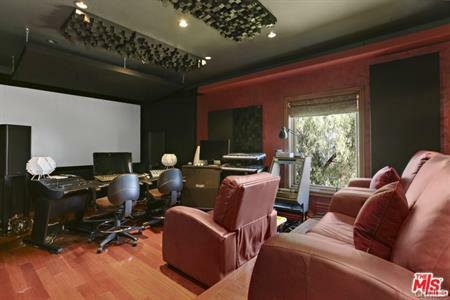 Private, gated Rock-n-Roll compound with pro recording studio appropriately located in the Melody Acres neighborhood of Tarzana. Dual entry gates provide secure parking for many cars and a RV/tour bus. 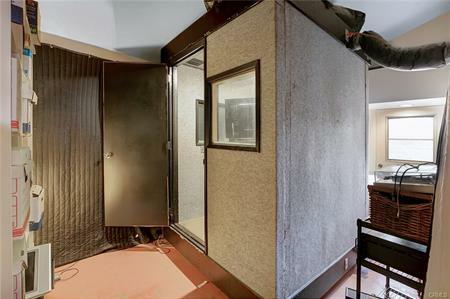 The Recording Studio is isolated from the rest of the house with its own entrance. 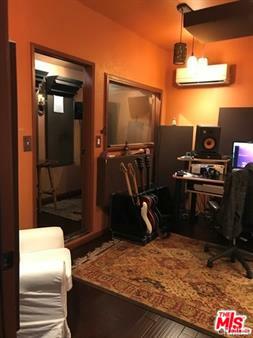 There is a control room, a diamond shape iso/vocal booth, a large live room and a separate amp room. 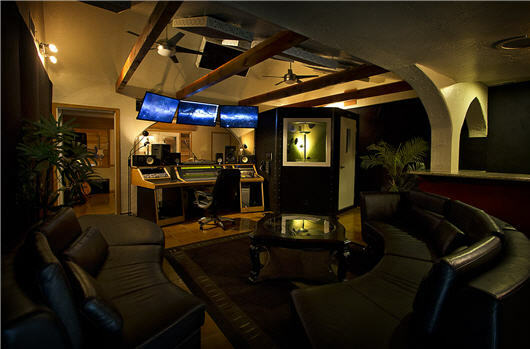 The studio also has its own private ½ bathroom and a lounge area with a custom-built dry bar with granite counter tops. The house is nearly 2,400sf and has 4 bedrooms and 3 full bathrooms. All bedrooms have private exterior entrances. Spanish tiles, hardwood and engineered wood flooring and solar tubes for natural lighting. Kitchen with breakfast nook, pantry, granite counter tops and a laundry room. The master suite has a cedar-lined closet, recessed lighting, and master bath with dual vanities, spa tub and glass enclosed separate shower. The detached 2 car garage is converted to a bedroom and an office. Also, an outdoor fireplace, Jacuzzi-style spa and a terraced backyard with a gazebo and lounging areas. All this on a private, 18,000+sf lot with drought tolerant landscaping surrounded with vinyl fencing. 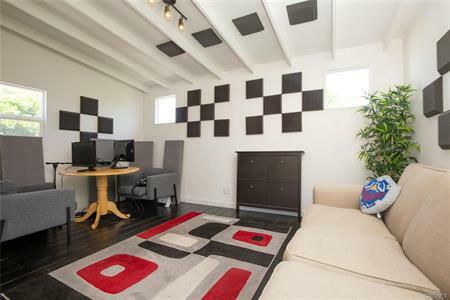 Close to Ventura Boulevard, perfect for live/work or great for traveling artists to stay while recording. Owner may consider sale Dramatically perched high above the San Fernando Valley in beautiful Woodland Hills-South and nestled conveniently at the end of prestigious Bedel Street. Sellers recently invested over $300,000 remodeling and renovating. Spectacular panoramic views, sunsets and the ever present wildlife, all from the scenic viewing deck, master bedroom balcony and outdoor sitting areas. Artistic architectural with that special warm Topanga Canyon vibe. Soaring living space, wood beamed vaulted ceilings, chef's kitchen with 3 walk-in pantries, a sound proofed recording studio with a separate entrance, and built-in custom cabinetry throughout, this property truly has it all. The master wing boasts a sitting area, sensational shower and over-sized bathroom, grand walk-in closet, one-of-a-kind fireplace, and unobstructed jetliner views. The grounds include a newly designed pool/spa, organic fruit and vegetable garden, lush landscaping, mature trees, and the ultimate in privacy. 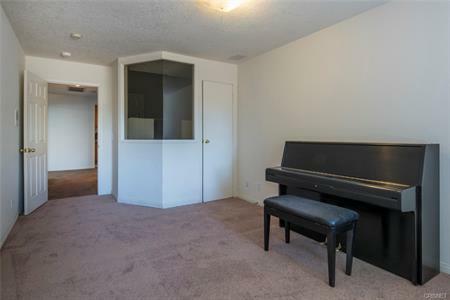 Great potential for a music studio! 3 bed/3 bath main house and a separate 960 sq ft unit with its own bathroom, driveway access, and zoning that allows for legal business operations. The private and expansive lot has only one neighboring home within 30 ft of the property line, and lush trees surround the resort-style backyard that features an enormous solar-heated pool and massive flat grass area. The living's easy inside as well with a vaulted-ceiling "great room" and cozy den. Top-rated Serrania Charter Elementary School! 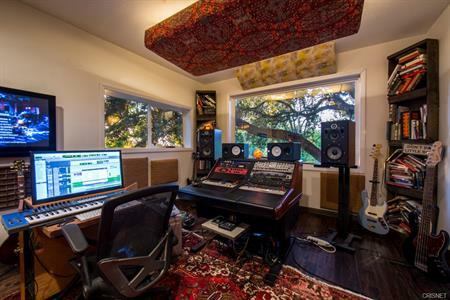 South-of-the-Blvd Encino mid-century home with music studio. Home to a late Emmy-nominated music composer, this 5 bedroom, 4 bath home features a gated entrance, hardwood floors, skylights, kitchen with granite counter tops and breakfast nook, family room with wet bar and wine closet, and a formal dining room. Spacious master bedroom boasts a marble fireplace, walk-in closet with dressing area and en suite bathroom with separate spa tub and shower. The 5th bedroom was converted to a composer’s music studio and iso room, with its own bathroom and separate entrance. Amazing sun room with spa grotto that leads to the breathtaking guitar-shaped pool. Located on a quiet cul de sac within walking distance to Ventura Blvd, shops and restaurants. Owner may consider sale Situated on a cul-de-sac in Chatsworth's prestigious and gated Trammell Estates, this Mediterranean-style estate boasts mature landscaping, inviting curb appeal, and a functional layout. Double front doors, dramatic two-story foyer, custom chandelier and soaring ceilings greet guests. Main floor features a formal living room, dining room, family room and chef's kitchen, along with upgraded travertine and marble floors. 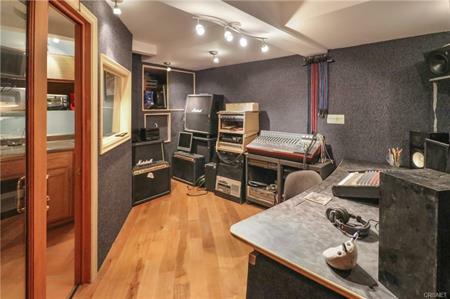 The main floor also offers music studio, laundry room and powder room. Upstairs, you'll find the spacious master suite along with two additional bedrooms, all with ensuite bathrooms. The upstairs' bonus area brings added versatility and luxury to this home! Outside, the backyard showcases a resort-style swimming pool and spa, BBQ area and gazebo. Gated English Tudor style home with a lushly landscaped backyard, lagoon pool and waterfall. Very spacious 6 bedroom, 5.5 bathroom family home, and an entertainers dream property! All rooms are oversize. The entry welcomes you to a step-down open living room with fireplace and soaring ceilings. Family room with bar and a large formal dining room. Huge island kitchen with breakfast bar and black granite counter tops. Sliding doors open to the back yard. A dramatic circular staircase leads up to the sprawling master bedroom suite with a separate sitting room with fireplace and a huge bathroom. 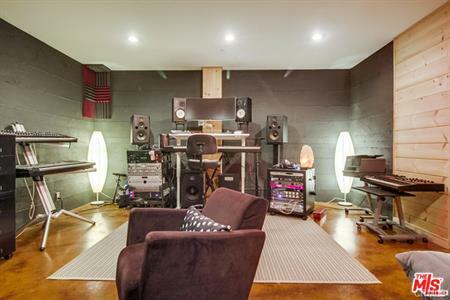 Three other bedrooms are located on the upper level, one which is used as a music studio and has a recording booth. Large bonus space that could be a media/theater room or ??? 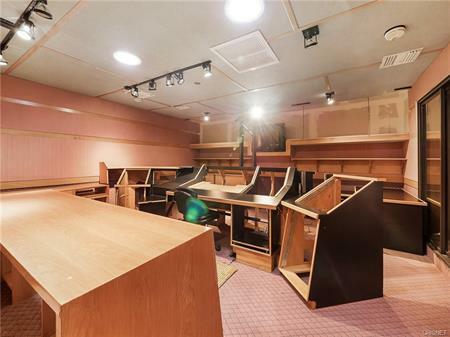 Separate laundry room, gym, separate office spaces and a 3-car garage. You will not find a better value at this price!!! Stunning Jay Vanos architectural located on a peaceful and private lane in the climate perfect Fernwood area of Topanga Canyon. Numerous windows, doors and decks for the expansive views (mountains and distant downtown LA lights at night). On cool days, the ocean fog rolls over the hills and at dawn and dusk the adjacent protected parkland is alive with wildlife. There is easy access to a quiet dirt road, also there are pristine trails that can be accessed right from the property. This bright and airy modern home has three bedrooms, two full bathrooms and a powder room, plus a den and a separate 400 sq. ft. space under the garage that is currently a music studio. So many features to this "smart house." Valley Circle Estates. This home is private and gated with huge grassy lawns and a free-form pool with waterfalls and stonework. The downstairs interior is an open concept with large scale rooms and voluminous ceilings. The family and dining rooms flow into the oversize, fully upgraded Chef's kitchen that features 2 Sub Zero refrigerators, Viking range, center island and tons of counter space. Formal living room, large private office and a 2-bedroom suite round out the bottom level. The elegant stairway leads up to the huge master suite with French doors accessing the large wrap-around balconies with amazing views. 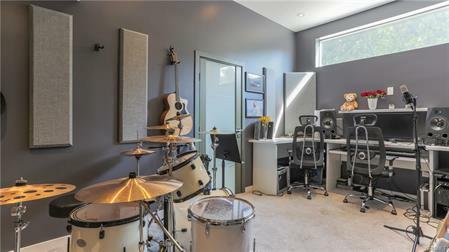 In addition to the other 3 bedrooms with en-suite baths, you will also find a home music studio. 3-car garage with direct entry. Mature landscaping, built-in BBQ and large patio areas with city and mountain views. Located adjacent to The Village, freeways and beaches. This ultimate musicians/producers compound is ideally set in the prestigious Medea Valley Estates; a luxurious private gated community. 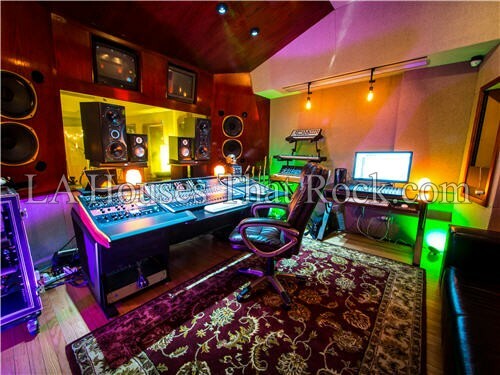 This beautiful estate property has a main house, extremely rare and professionally built 2000 square foot multi-million dollar recording studio with attached guest suites (detailed specs available upon request), gated pool/spa and sports court. Additional features include: 5 Beds, 3 1/2 baths (main house), exquisite finishes throughout, over an acre of land, private gate, views of the Santa Monica Mountains, easy access to hiking, biking and horse trails, luxurious master bedroom with fireplace and walk-in closet, fully equipped kitchen with Viking appliances, large island and breakfast nook, beautifully landscaped yard with waterfall, many spaces to entertain and relax, deck with views of Lady Face mountain, built-in BBQ with prep sink and refrigerator and located only 15 minutes away from the beach! 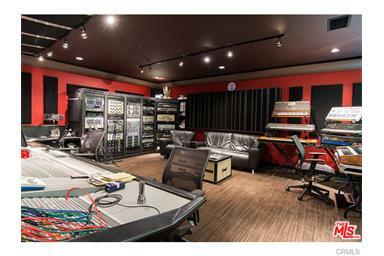 Unique celebrity-owned view property with recording studio in a guard gated community of Calabasas. This custom estate has panoramic jetliner views of the valley and is perched on its own hilltop in a cul-de-sac enclave. The main house is almost 10,000 sqft. with a subterranean (approx. 3,000 sqft.) garage, of which approx. 2,000 sqft. 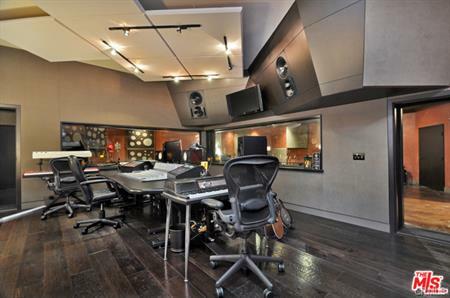 houses a state of the art recording studio with control and two live rooms. This property features an atrium in the middle of the home with retractable roof and sprawling bamboo for a very serene "zen like" feel to the open floor plan. Additional features include indoor koi pond, indoor spa, wood beamed ceilings, home theater, wine room with 2nd kitchen, separate bar area, stunning master retreat with views, library/office, two fireplaces, piano shaped swimming pool with spa. All this just up the street from Calabasas country club which features a championship golf course. Fully private and secure compound south of the Boulevard. Masterfully designed with modern luxury. 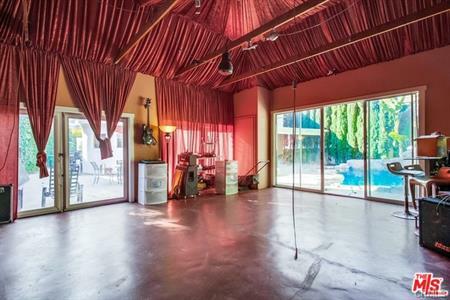 An entry with character, stainless steel door opens to dramatic ceilings and the ideal entertainer’s floor plan. 1st floor has master-suite, home theatre and office. Clean and modern kitchen with breakfast area, quartz countertops, built-in Miele stainless steel appliances and contemporary cabinetry. Massive master-suite with its own seating area, fireplace and glass doors leading to a zen garden. Master bath has marble slabs imported from turkey, his/her rain-shower and walk-in closet. Highlights include porcelain floors imported from Spain, 4 fireplaces, Sonos sound system, western-style toilets with seat warming/bidet washing, heated floors, recessed LED lighting, smart-home with Nest, and a music studio. Pool with waterfall, 3 car garage, miniature golf course and private gym. Also for Lease at $24,500/month.